Nastasia Wong's passport must have a lot of stamps. And her Instagram, @nastasiaspassport, has a lot of beautiful photos from around the world. We recently invited the globe-trotting founder of Dame Traveler to join us aboard the Azamara Journey for a journey through the Greek Isles. 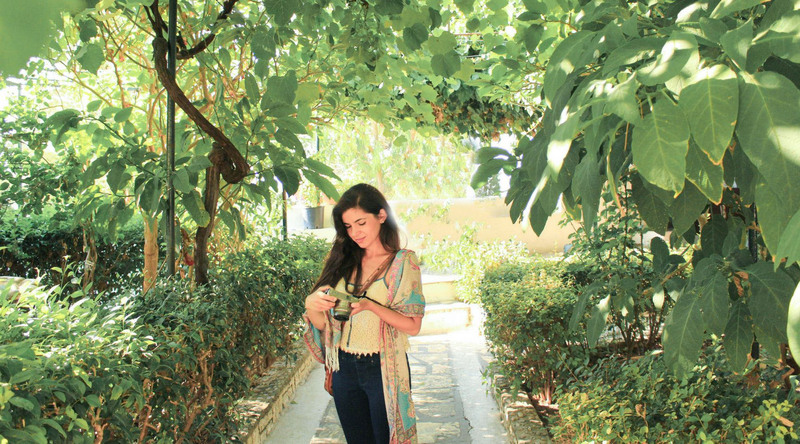 Nastasia captured the beauty, history, and charm of Greece in her inspired photography. We hope you enjoy this photographic journal from four of the most alluring and interesting ports. Corfu is known as the real-world island inspiration for Shakespeare's play The Tempest, and it has an old-world charm that will make you feel as though you've traveled back in time. The island is home to unbeatable beaches, stunning views of the cobalt-blue sea, a UNESCO World Heritage Site Old Town, and picturesque hillsides covered in Cyprus trees, olive groves, vineyards, and citrus trees. This was Nastasia's first visit to the island. She said, "I've never experienced a Greek Isle quite like this before. The fact that it is so lush took me by surprise." One of the best things about cruising is getting to wake up in a beautiful new destination each day, but only having to unpack once. Can you imagine being greeted by this soft pink sunrise in Corfu? High atop a hill, looking down on the Paleokastritsa beach, you'll find the Byzantine Paleokastritsa Monastery. Stroll the beautiful gardens, stop in at the small museum, and take in the incredible views. The island is also a haven for foodies, so don't miss out on enjoying an authentic lunch and glass of local wine. When you imagine the Greek Isles, what likely comes to mind is Santorini. The whitewashed houses perched on staggering sheer cliffs have become the quintessential image of the region. But Santorini doesn't lack color. Vibrant pink flowers, black and red volcanic beaches and the occasional blue domed roof stand out in the landscape. At dusk, Santorini begins to glow. It's the perfect time to enjoy a glass of local wine and watch a famous Santorini sunset. At night, Santorini lights up. The island doesn't have the reputation for nightlife that, say, Mykonos does. Though nothing will upstage sunset, Santorini after dark is a picturesque place. Fashionable. Fun. Fetching. Mykonos is a trendy town, chock full of hip cafes and stylish boutiques. It's the perfect place for a seaside lunch, for afternoon window-shopping, and a sunset stroll through the "Little Venice" neighborhood. Though not a Greek Isle, Athens is a wonderful port to begin or end your cruise. With over 3,500 years of history to explore, you can visit the Birthplace of Democracy many times and always find something new to discover. Don't miss out on Athens' food scene when you visit. Try a gyro (or two, or three), and pick up edible souvenirs like honey, spices, and olive oil. Have Nastasia's photos inspired you to start planning your own voyage? Click here to browse our current travel offers.